This house does have air conditioning to cool off on those hot days. Because of the tight knit neighborhood, a maximum of six (6) people are allowed at this property at any given time, this includes overnight and daytime guests/visitors. Del Mar Cottage is the charming 1920's Air Conditioned cottage by the sea you've been dreaming about. The character of this cottage, from traditional architectural details like crystal door knobs and elegant crown molding with beautiful easy open windows to let the cool sea breeze in, make this get a way a 'must stay'. Relax on the garden's porch swing while reading and sipping your favorite lemonaid. Later enjoy some stargazing from your luxurious outdoor spa while planning the next day's ferry ride, antiquing or golf game. Just 15 minutes north of Gig harbor is Del Mar Cottage's tiny neighborhood of South Colby, nestled between Port Orchard, just 5 minutes to the West, or the Southworth ferry dock to Seattle, just 4 minutes the East. This charming cottage seems to have guarded the bay for many, many decades. Make Del Mar Cottage part of your next get away. You'll want to come back every year! Walks & Dog Lovers: There are several wonderful walks to take your dog on for an adventure. By the way, the house allows a maximum of two dogs, and each dog is a separate pet fee. Del Mar Cottage is one house back from the beach, but there is a quiet, single lane frontage road that is directly on the beach, great for walks and viewing all that the beach has to offer. The frontage road (SE Cornell) is just west of the Del Mar Cottage gate. Then, just 1/8 of a mile east from the cottage is Harper Pier, overlooking Puget Sound. Continue your walk another 1/8 of a mile to the park just past SE Scatterwood Lane; great for letting the dog run in the fenced little league base ball area. Across from the park is a natural boat and kayak launch, great for letting the dog play in the water! We were lucky enough to find Del Mar Cottage years ago. The home has been beautifully maintained since the 1920’s and we thoroughly enjoy the opportunity to share its beauty with travelers worldwide. We have enjoyed this location because of the water views and the short 40-minute trip into Seattle via the nearby Southworth Ferry. Listening to the waves against the shore in the evening, and waking up to the sounds of the morning brings a peaceful start to your day at Del Mar Cottage. Save some time for beach combing or strolling to nearby Harper’s Pier. View of the Puget Sound. 30 Megabit internet. Wired or wireless. 30 Megabit wireless connection available. Coffee Maker and french press. Plenty of plates, bowels, silverware, drinking glasses, and coffee mugs. We have squeezed in 10 around this table for the holidays. Lot's of books to read. Debbie Macomber is a local favorite. 6 person hot Tub/Spa with 45 jets, neck massaging jets, and a lighted waterfall. Available year around. We ended up not being able to stay at our original cottage but this place was so cute and adorable. They worked very hard to make it right and we so appreciated being able to carry out or first vacation in several years! It was so tranquil and we loved every minute of it. We had a lovely stay with friends. The house is very cozy and clean and we enjoyed the fireplace and hot tub. Communication with the owner went well and he handles any questions or comments professionally. The only thing I wish is that there was easier access to the waterfront. Otherwise I would recommend this place, especially for a cozy winter getaway. 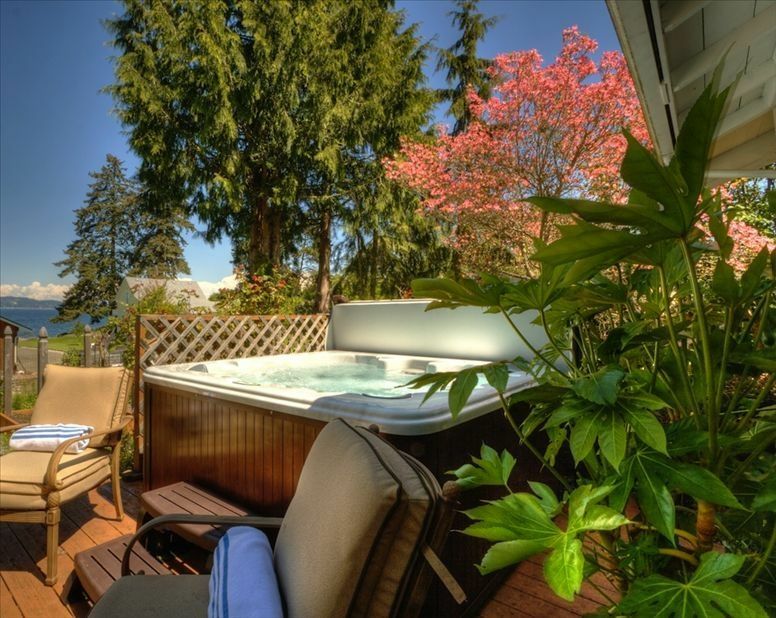 Property was perfectly clean with a view and hot tub. This Cottage worked out perfectly for our impromptu Thanksgiving week with family that has not been together in 13 years. There was room for everybody and the views of the sound and animals were perfect. We had geese and deer going through the back yard, just a few hundred feet to the Sound. House was warm and comfortable, with complete instructions on how to utilize the property waiting for us on the dining room table with a complimentary bottle of wine. It is obvious the owner takes pride in the product he offers. Thank you for allowing us to rent the Del Mar Cottage. My wife and I stayed in the cottage for our annual anniversary celebration. The Del Mar Cottage had everything we were looking for and more. It was clean, cozy and welcoming. The kitchen was well stocked, including a nice variety of spices. The decor and cottage architecture were great. All the outside seating areas were comfortable and inviting. Truly an oasis away from the hustle and bustle. This place is very comfortable from the temperpedic king sized bed to the multiple areas of outdoor chairs and of course, the hot tub. I never got to enjoy the hot tub as we always seemed to come back too late and too tired, but it looked great. Remember, this was built in the 1920's, so there are some places that need updating or maintenance, but nothing that was distracting from what we were looking for. It was a nice touch to have the vacuum available so we could keep the place clean during our stay. Was a nice relaxing stay in an older, comfortable cottage.